The search found 73 results in 0.1 seconds. A mixed picture emerges from a new study commissioned by the Peter G.Peterson Foundation on America's Affordable Health Choices Act of 2009 (H.R. 3200). The study examines the most recent version of Patient Protection and Affordable Care Act and the House-passed Affordable Health Care for America Act, and it provides the first long-term comparative analysis of the costs of the House and Senate health care reform legislation. The rapid growth in health care costs is the largest and fastest growing fiscal challenge. Issues in Brief: Who Benefits From Medicaid? Most Medicaid dollars are spent on disabled and elderly beneficiaries, whose incomes and financial resources are low enough to qualify for the program. 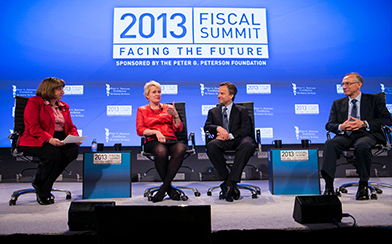 The Fiscal Summit's first afternoon panel focused in the U.S. healthcare system. America spends more per person on healthcare than any other nation. yet when you compare health outcomes, the U.S. is not getting its money's worth. The Trustees warn that Congress and the Administration should work "with a sense of urgency" to put the program on a sustainable path.